Hot, cold, wet, dry, flood, drought, snow, fire, ice … whatever, it’s all ‘global warming’. And it’s all your fault. Last year, climate fraudsters said global warming causes drought in Texas. This year, the same pack of criminals say that global warming makes Texas wet. Floods of the Brazos River in Texas. 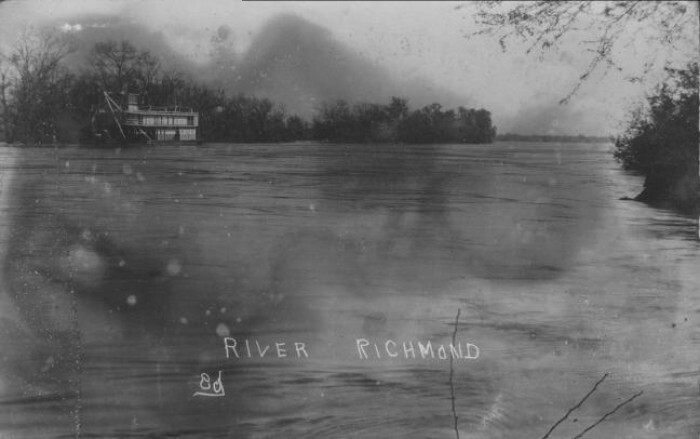 This is what the Brazos River looked like during the actual record-breaking flood of 1913, which according to NASA was one of the coldest years ever. These climate criminals have absolutely no shame about ramping up the lies and contradicting themselves with every single story they write. – RSS and UAH satellites measure the lower troposphere – the precise area of the atmosphere where “Global Warming” theory is measured. Alarmists now point to the oceans as the main component of the “Global Warming” system. They do this precisely because the atmosphere has indeed stopped warming, despite the fact that 35% of all human CO2 emissions, since 1750, have been emitted over the past 18 years, with NO atmospheric ‘Global Warming’, at all. A terrible stat for the global warming cult. – The name ‘Global Warming’ was changed to ‘Climate Change’ when it became obvious the atmosphere had stopped warming. This suits the agenda nicely, as the name ‘Climate Change’ cannot be falsified. The ‘climate’ always changes. Hence, any metric can be used to prove their theory: hot, cold, wet, dry, drought, flood, fire or ice. Therefore as a ‘science’, the theory of “climate change” is a null-hypothesis. It is therefore pseudo-science. – Lower tropospheric Satellite temperature data was all the rage in the 1990’s when it ‘was’ warming. Now it is scoffed at by the global warming clique. – Any adult entering university/college this year, or next, would have never ever experienced any ‘Global Warming’, at all, in their entire lives. One-third of Man’s entire influence on climate since the Industrial Revolution has occurred since January 1997. Yet for 224 months since then there has been no global warming at all (Fig. 1). With this month’s RSS temperature record, the Pause sets a new record at 18 years 8 months. Figure 1. The least-squares linear-regression trend on the RSS satellite monthly global mean surface temperature anomaly dataset shows no global warming for 18 years 8 months since January 1997, though one-third of all anthropogenic forcings occurred during the period of the Pause.